Several months ago, we operated on this case. To remind ourselves, we saw a large perforation of the Schneiderian membrane and an absence of buccal bone plate. We resolved these situations by suturing the membrane and performing a regeneration of the absence of the bone plate using titanium mesh. Four months later, with no symptomatology, the patient came in to undergo the gingiva former stage. She told us that she was experiencing irritation, so we decided to open the area to see what was happening. 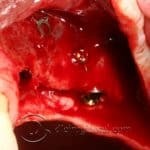 As you can see from the photographs, the mesial implant – which had an absence of buccal bone plate – was now embedded in the bone with no differentiation between the graft and the remaining bone, presenting a new buccal bone plate. Neither could the lower limit of the Cadwell-Luc access for sinus lift be seen clearly. We partially removed the mesh that was irritating the patient, and referred her to our prosthodontist colleagues for commencement of the prosthetic stage. We hope the evolution of this case is interesting to you. Gracias por la publicación de este caso tan interesante.